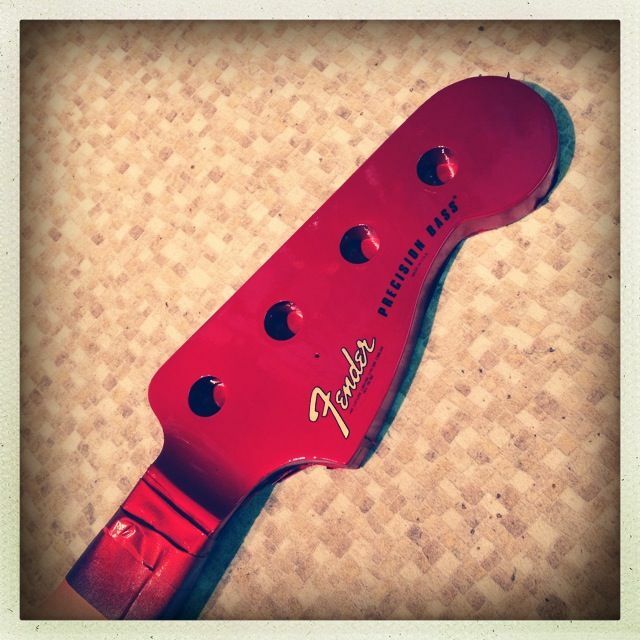 Candy-apple red has been a Fender staple for a long time. These candy colours are achieved by spraying a clear lacquer that's been toned with a coloured dye over a metallic finish. It's a great-looking finish and I love it. And I'm not alone. 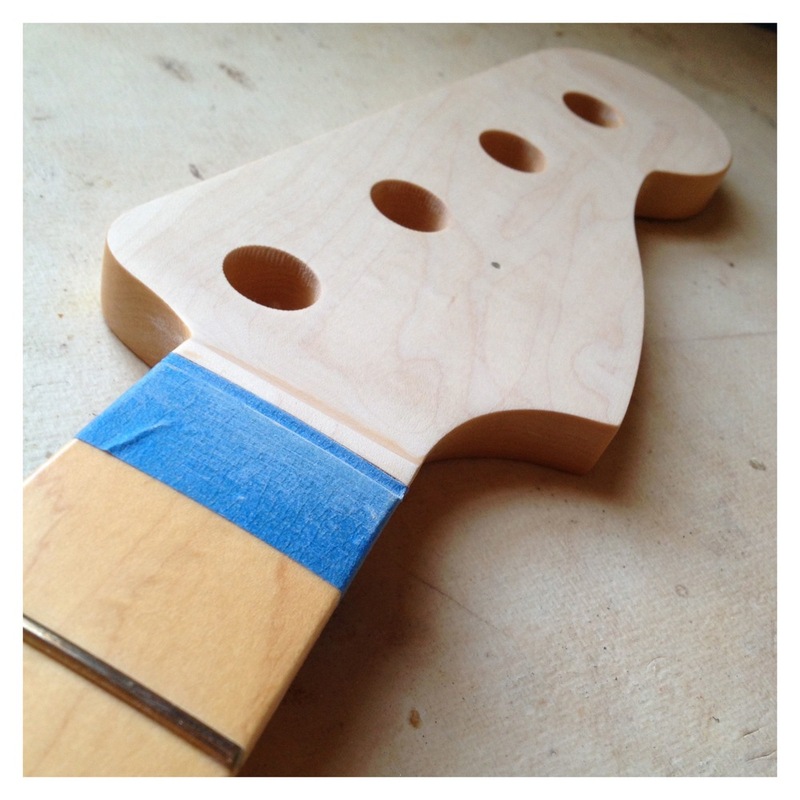 Which is why I'm refinishing the front of a P-Bass headstock to match the candy-apple finish on its body. 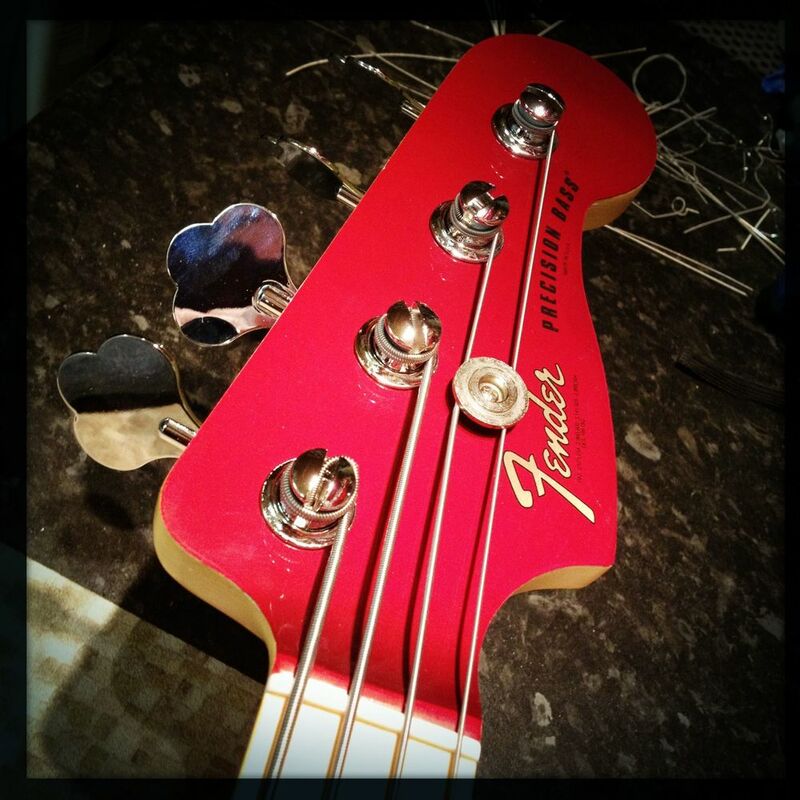 Regular old P-Bass headstock. Nothing special. Let's get to work. First up, stripping. A liberal application of elbow-grease helps me to sand off that original finish and we're back to pale, raw, maple. Preparation is important at this point as we'll be putting down a metallic finish on this and that needs a flaw-free surface. A couple of coats of sealer/lacquer next. These are sanded down flat before I apply the metallic. In most cases, I'll mix my own metallic finishes by adding bronzing powder (essentially tiny particles of metal) to clear lacquer. Metallics are tricky. I've got to be careful as any imperfections or runs mean removing the finish and starting again—it's not possible to hide any 'fixes' in a metallic. Some dye added to clear lacquer. By mixing and altering ratios of different coloured dyes, it's possible to match the colour on the body. Matching can be tricky and, once matched, it's important to remember that if you have to add another coat, that will shift the colour. Even clear coats can change how the colour looks. And let's talk about the clear coats. With a headstock, I have to apply some decals first, though. These will be covered over by a number of coats of clear lacquer. These coats will seal everything in and will give me enough 'build' to sand and buff at the end. That 'end' may be a while off though. Finishing in this way requires time. These finishes are evaporative which means they cure or harden as the solvents in them evaporate. That takes time. How long can vary with different finishes and even weather conditions but don't expect it to be less than ten days and a fortnight or more is safer. 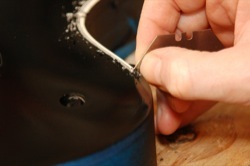 The final result can be compromised by rushing this.